Home > Health Matters > Are Computers Bad for Children? Computers are a huge part of modern life and becoming more so as all our digital devices become pocket sized, and wireless. But will all this technology damage our children, or should we let them embrace their computer future? Some experts suggest letting your child get familiar with a computer from as young as a few weeks but most agree that two is probably the youngest age at which they will get any positive stimulus from the computer. 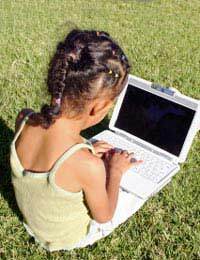 For children this young, limit their computer time to a few minutes a day and don’t force it. Most two year olds won’t sit still for ten minutes anyway so they are good at self regulating. There is no scientific proof that computing is bad for toddlers but educational and development experts believe that extended periods of time at the computer can cause problems with creating social bonds in later childhood. Children with no computer experience have been shown to struggle when they get to school and have to keep up with other kids who have been using them for a couple of years. Even with older children computer time should be limited. For preschoolers keep it to less than thirty minutes per day and school aged kids should be limited to two hours of ‘screen time’ (including TV) per day to avoid eye strain and over stimulation. Computer addiction is a serious problem and is increasingly common in kids who spend long periods of time on the computer, especially those using the internet or playing fast paced games. The level of stimulation that these games offer results in children needing more and more stimulus in ‘real’ life in order to concentrate. Computer addiction is rare in children who use the computer for reasonable blocks of time. Do computers help or hinder children’s learning ability? It depends on how they are used. Computers can offer huge learning advantages in maths and literacy as well as transferable skills such as problem solving, motor skills, memory and spatial awareness. Even some computer games help to hone these skills and can help children learn new skills. Some studies do suggest that computers can help children with learning difficulties as the interactive interface makes it easier for them to concentrate on the task given to them. Childhood is supposed to be fun and as part of a balanced lifestyle including outdoor play and other more social activities computing is a perfectly safe past time. Whether your child is using the computer for craft projects, to meet friends with similar interests or to play games as long as you are happy that the content is appropriate then they will get a lot from the experience. One area of concern with children and computing is that it can damage their physical development if they are not sitting properly and taking regular breaks. Get your child into good habits early on and you’ll save them years of back ache in later life.